There is a common misconception among homeowners that it does not matter what lawyer they hire to defend their foreclosure case. Most consumers believe that if they have not paid their mortgage they are ultimately going to lose their case so why pay more to get one of the best lawyers. This belief may sound logical but if you ask a judge, judicial assistant, court bailiff of any lawyer who is in foreclosure court day in and day out, they will tell you the belief is wrong. Hire a below average foreclosure lawyer and you will likely be no better off than you would be actively representing yourself on a pro-se (self-represented) basis. Hire the best possible foreclosure defense lawyer and you will not only stay in your home much longer but there is a substantial chance the lawyer will win your case outright or settle it on favorable terms. Unfortunately there are a lot for lawyers who say that they do foreclosure defense when all they really do is foreclosure delay. Often when the Court sets a block of 30 cases for foreclosure trial, in 3 there are loan modification settlements, in 26 the homeowner or the homeowners lawyer agree to give up the home (consent to judgment) in exchange for an 90 day sale date and in 1 case there is actually a trial. When this happens in Broward or Miami-Dade there is a good shot that one case going to trial will be defended by Evan Rosen. There are a large number of foreclosure defense lawyers with ZERO trial experience. There are others who just do not want to invest the huge amount of time it takes to prepare for a foreclosure trial. There are very few lawyers defending foreclosures who regularly try cases like Evan does and he wins an outstanding portion of his trials, an astounding feat given that “our client paid every month” is something that is NEVER heard in foreclosure Court. Long before the foreclosure crisis hit Evan Rosen was trying serious personal injury and complex Civil Litigation matters to verdict before South Florida juries. Trial work is his passion and he is great at it. Rosen was so disgusted by other lawyers just giving up and consenting to judgment that has put on seminars for other foreclosure defense lawyers to teach them how to try cases. He is so well respected by other foreclosure defense lawyers that in Fort Lauderdale and Orlando, he had a full room of lawyers paying over one thousand dollars each, to learn his trial techniques. The lawyers who try cases for banks, usually work for foreclosure mills, where young inexperienced lawyers have 600 to 800 foreclosure cases on their desk. Nobody goes to law school dreaming of taking peoples homes away. Foreclosure mills representing banks often hire new law school graduates from third-rate law schools. Foreclosure mills can run over homeowners who do not hire lawyers and fail to even show up for their trials. Foreclosure mill lawyers rarely face off with a top trial lawyers like Evan Rosen. In a properly defended case, that bank has far more issues to prove that just that the homeowner did not pay. The bank, as the plaintiff, has to win every issue to win the case. Rosen has an uncanny ability to find the one or two issues where the bank is weakest and win those issues. 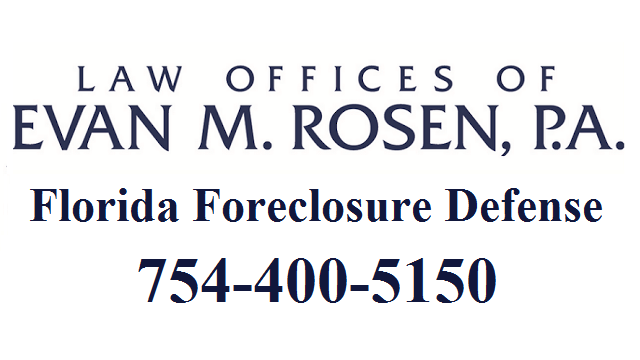 If you are looking for a South Florida foreclosure defense lawyer, Rosen should be on your short list. If you interview two law firms to find the one with the right fit, ask both to show you trial judgment (with their client’s names redacted) where they have taken a case to trial and won. Rosen can show you a whole bunch of these. If your home is your biggest asset and your mortgage is you biggest debt, which lawyer you choose for what could be the biggest legal and financial fight of your life is important. Put as much time into researching lawyers as you would buying a home or car. Choose wisely. If you are in South Florida and are looking for help with debt, foreclosure, real estate or want more information about bankruptcy law, call (754) 400-5150 or fill out the online form for a FREE CONSULTATION. Let the lawyers and staff at the Law Offices of Evan M. Rosen serve you! Practicing law since 1997, Evan’s focus is on providing the best possible legal representation to his clients in foreclosure defense, debt defense, bankruptcy, and real estate matters. He has assembled a caring and highly skilled legal team that shares in a common philosophy and purpose; focus on serving the clients first and allow everything else to follow from there. You can learn more about the Law Offices of Evan M. Rosen, P.A. and the types of cases the firm handles from the information provided on his website, or contact the office today by e-mail or by calling 754-400-5150. The Law Offices of Evan M. Rosen serves ALL of South Florida. President of South Florida Foreclosure Defense Lawyers – An invitation only, South Florida group of lawyers who focus their practice on defending those in foreclosure and upholding the rule of law. Member of JEDTI – Jurists Engaged in Defending Title Integrity – An invitation only, statewide group of Florida attorneys who serve others in defense of foreclosure, preserve the integrity of our real property title laws, and fight back against abuse of the due process and lack of adherence to the evidence code and rules of procedure.